President of Venezuela, Nicolás Maduro, has granted an exclusive interview to RT in which he discusses the political crisis in the Latin American country and explains how war can be avoided. The self-proclamation of opposition leader Juan Guaidó as president of Venezuela on January 23 has divided the world into two groups of countries, those that support the legitimate government of Venezuelan President Nicolás Maduro and those that recognize the current president of the National Assembly. In the midst of this acute political crisis that is shaking Venezuela, RT has spoken exclusively with President Maduro, who offers us his vision of the current situation in the Latin American country. “I don’t care how I go down in history. I am not going to pass as a traitor, as a weak man, as a man who turned his back on his historical commitments, on his people,” the president assures, underlining that his objective is to fulfill his functions and denounce the aggression of his U.S. counterpart, Donald Trump. “I pray to God that our country does not reach an American invasion,” Maduro proclaims in the interview. According to Maduro, the European countries and the Lima Group have made a diplomatic mistake in recognising Guaidó, following US orders, and giving an ultimatum to the elected government. “In Europe they have recognized something that does not exist”, he says in relation to the self-proclamation as “president in charge” of the Venezuelan opposition leader, since – he emphasizes – in Venezuela there is only the government he presides. 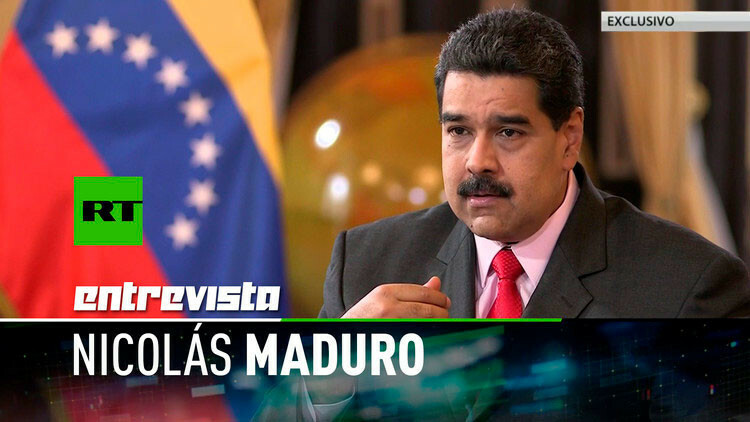 In particular, Maduro believes that the President of the Government of Spain, Pedro Sánchez, “is committing an error of the magnitude of that of José María Aznar” in the war in Iraq, who, he said, “was filled with blood forever” after putting himself at the service of the United States. In this sense, he said that if a U.S. invasion occurred in Venezuela, “Sánchez’s hands would be filled with blood forever. In reference to the calls launched by different countries for early presidential elections, the president emphasizes that he will not call them, because “in Venezuela there is no election deficit” and the only ones pending are the parliamentary elections, which, in accordance with the electoral calendar, should take place in 2020. “The problem is in the opposition, not in one more election. We have had 25 elections in 20 years. In the last 18 months we have had 6 elections. The elections in 2018 were brought forward by the opposition’s proposal,” he concludes. The Venezuelan president considers it necessary “to demand that the economic, financial and commercial blockade against the Venezuelan people cease […]”, so that the resources of this country “kidnapped by the world” can be released and this can lead to a national recovery. “The hyperinflation produced by a parallel criminal exchange rate does us tremendous harm,” said Maduro, who was optimistic about the set of market policies promoted by his government that, in his opinion, are beginning to produce good results. In this sense, he explained that his Executive contemplates two measures in development to stabilize the Venezuelan economy: the creation of new parameters to fix the real value of the foreign currency and the testing of an agreed price system that “does not allow the direct impact of the price to products. “We are facing an economic war,” says Maduro. He also recalled that “the social protection of employment, social security, national income and pensions” is one of the priorities of his government’s active policy. “For the great tasks of the economy […] Venezuela is going to need at least 10 more years in the underpinning of a solid productive apparatus that generates sufficient diversity in the national wealth,” says Maduro, who emphasizes as a final objective that Caracas does not depend solely on one good, in this case oil. “Those who leave the country let themselves be carried away by siren songs”. “Many Venezuelans left with hope for improvement. And what did they find? Xenophobia, persecution, exploitation, slave labor,” says Maduro, questioned about the compatriots who leave the Bolivarian country and who, in his opinion, “let themselves be carried away by siren songs. The reason why the U.S. wants to intervene militarily in Venezuela lies in natural resources – such as oil, gold or gas – since Caracas has no weapons of mass destruction and poses no threat to Washington, argues Maduro. Likewise, the Venezuelan head of state includes in the ‘casus belli’ against Venezuela “the moral wealth of the Bolivarian revolution” and “put an end to a revolution that sets an example of independence and social justice. Maduro, who has called the U.S. proposals for humanitarian aid to Guaidó a “political show,” warns that imperialism does not help anyone in the world, but only “carries bombs” and “causes deaths,” as has already happened in Afghanistan, Iraq, Libya and Syria. “I’m not going to accept any kind of interventionism,” underlines the Venezuelan head of state. When asked if he is willing to negotiate with Guaidó, the president replied that he believes that the opposition leader is “a circumstantial instrument” chosen by the Venezuelan opponents “for an adventure scenario that they know will fail.” He also took advantage of the occasion to call for a dialogue with all opposition parties and to thank those governments that have expressed their dialogue and diplomatic position to resolve the current political situation in Venezuela. Response against sanctions: “Venezuela is self-sufficient”. Washington’s sanctions against Citgo and Petróleos de Venezuela, S.A. (PDVSA) are “a measure of seizure, of illegal confiscation,” under U.S. law, after which Caracas has taken legal action. “What they have done has no name, it has never been done against any country,” Maduro denounces. Texan oil company Citgo, a PDVSA subsidiary, is at the center of the political battle over Venezuela’s future, as it is a vital source of liquidity for Maduro’s government, which is why the U.S. gave Guaidó control of its assets. Also, on Monday last week the White House froze PDVSA’s funds in U.S. territory, valued at $7 billion, a measure that, according to U.S. Security Advisor John Bolton, would result in additional losses of $11 billion over the course of this year. In any case, Maduro emphasizes that Venezuela is self-sufficient and does not depend on income from U.S. oil sales, while recalling that they are selling crude oil to other countries such as China or India, with the goal of reaching “production levels of 2.5 million barrels” daily in the middle of this year. Peace diplomacy and world public opinion must help prevent an American invasion, which would be “unpayable from the point of view of military and human costs” for Washington, warns Maduro. “There will be no war or military intervention in Venezuela,” the president stresses, pointing out that “this does not mean that we are not preparing to defend our land, which is sacred. “I take advantage of every means of communication to ask the whole world to come out in peace to denounce and stop the madness of Donald Trump. Venezuela will never surrender. A wave of consciousness, of world sensitivity, is beginning to rise. And every day that passes there will be a greater repudiation of Donald Trump,” says the Venezuelan president. Faced with the internal threat of a coup d’état looming over Venezuela, Maduro bets on the initiative proposed by Mexico, Uruguay and the members of the Caribbean Community (Caricom) in order to “build a scenario of understanding,” he said. Asked about the words of Bolton, who suggested that Maduro resign and have “a pleasant and peaceful retirement on a beautiful beach,” the Venezuelan president explained that he would like to retire in Venezuela when he turns 90, accompanied by his “grandchildren and great-grandchildren. “I feel they despise us. Donald Trump, John Bolton, Mike Pompeo, Mike Pence…,” said the president of Venezuela, who denounced the “imperialist white supremacy” that the White House turns into “contempt for all the peoples of the world”. Next Post Venezuela: Coup d’Etat or Constitutional Transition?